Home What is Freemius & How Do We Use It? When you activate the WP Security Audit Log plugin you are asked if you want to opt-in to sending us diagnostic data that will help us improve the plugin, and to our newsletter, as seen in the below screenshot. This article explains everything you need to know about Freemius, what data is sent and why the WP Security Audit Log plugin uses it. If after reading this post you need more information or have any questions, please do not hesitate to contact us. We’d be happy to answer all your questions. Freemius is GDPR compliant and is an online service that helps WordPress plugins and themes developers market and sell their software. It does so by providing a payment gateway, license keys management system and also helps them capture and manage diagnostic data on how their product (in our case WP Security Audit Log) is being used. Such data is what helps us better understand how the users are using the plugin, thus improve it. For more detailed information refer to the Freemius website. What Data is Sent When I Opt-In? NOTE: NO WordPress audit / activity log data is ever sent back to us or Freemius. When you opt-in you also subscribe to our announcements newsletter so you are kept up to date with the development and features progress of the WP Security Audit Log plugin. to send security & feature updates notifications, educational content and offers (you can opt-out from the newsletters). For example when someone disables and uninstalls the plugin, through Freemius we are able to ask the user for a reason why they uninstalled the plugin. Such data is vital for us in understanding what users expect from the plugin and what new features they would like to see. In case of support, when a user has an issue we can learn about his setup from the data without having to ask the user to send us log files and other troubleshooting information, thus easing the process of assisting the plugin users. What If I Do Not Opt-In (Press No)? If you press No and do not opt-in NO data is sent to Freemius and the plugin will still work without any limitations. Can I change My Setting After I Opt-In or Opt-Out? Yes you can. 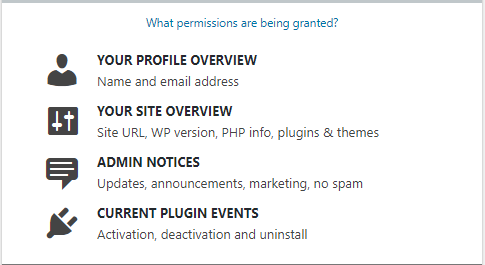 You have the option to opt-in if you have opted-out or vice versa in the WP Security Audit Log plugin listing on the plugins page in the WordPress dashboards, as highlighted in the below screenshot. If you have any questions or concerns, we would be more than happy to address them. You can get in touch by using our contact form. Thank you for using WP Security Audit Log to keep track of everything that happens on your WordPress websites and multisite networks.